The University of Vermont’s much anticipated Central Campus Residence and Dining Hall, under construction for two years, will open on August 26 when students return to campus. The dining hall portion of the new building is one of the most innovative in American higher education, designed to promote student engagement with open kitchen formats, live demonstrations and digital screens that provide nutrition advice and tell the story of UVM’s commitment to local food. At the heart of the dining hall space is the Discovery Kitchen and Exploration Station, which provides experiential culinary education for students. “Our vision is to transform students into lifelong learners who make informed choices within our complex food system,” said Melissa Zelazny, director of UVM Dining. “Students might learn how to pickle, make a base sauce or prepare their own dinner with ingredients from the Intervale Food Hub.,” said Susan Cathrall, operations manager for the new dining hall. The culinary team for the new Central Campus Dining Hall is led by Brandon Williams, campus executive chef. Williams, a graduate of the Culinary Institute of America, joined UVM Dining in 2015. He started his professional path at the Beacon Restaurant in New York City and Fog Island Café in Nantucket, Massachusetts, later moving to his home state of Vermont, where he worked at the Bristol Bakery and the Inn at Essex, also teaching classes there. 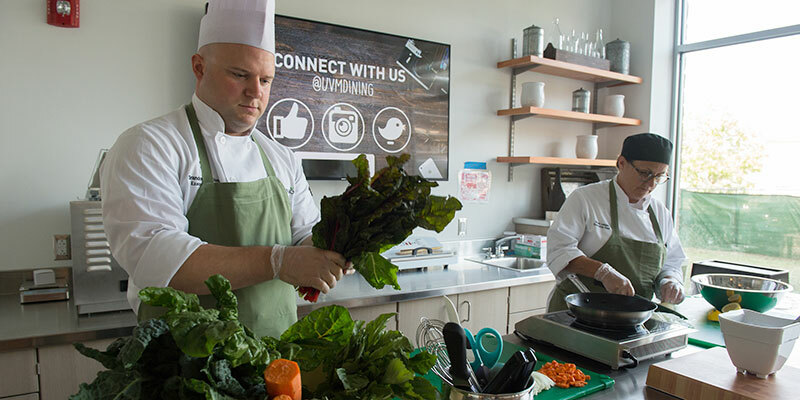 Williams’ passion and energy are an inspiration for his team, and his creativity led UVM Dining to surpass its Real Food Challenge goal – of 20 percent real food by 2020 – three years early. His ultimate goal is to convey his passion for food to the students so they will try new things and truly appreciate their food experience. Chef Sarah Langan, a graduate of Green Mountain College in Poultney, Vermont, the Culinary Institute of America in Hyde Park, New York, and L’Ecole de Cuisine Francaise in Littlington, East Sussex, England, will work directly with students in the new dining facility. A native of Syracuse, Langan joined the UVM Dining team in 2016 as the executive chef for the Davis Center. She is known in the community for her work running the South End Kitchen and as a chef instructor at New England Culinary Institute in Montpelier for more than 20 years. Joseph Perrella, executive chef in the Central Campus Dining Hall, joined the UVM Dining team in 2016 as the chef for Cook Commons Dining Hall. Perrella started his career in his family’s restaurant, and some of his earliest memories are picking fresh herbs and learning family recipes from his grandmother. His travels through Europe ignited a passion for seasonal ingredients, and, in 2005, he returned to his home state of Vermont to continue his career. Perrella is excited to produce authentic, creative cuisine and to inspire students to try new menu items. The dining hall will be open from 7 a.m. to 9:30 p.m. on Monday through Friday and 8 a.m. to 8 p.m. on Saturday and Sunday.